Friend, you can improve your homeschool today! It’s not magic. It’s not complicated. In fact, it is so much easier than you think. Today I’m sharing with you one of those posts that are straight to the point and no fluffs at all. Just plain practical help to improve your homeschool the easiest way possible. You pick one tip to implement a day of simply implement a bunch all at once. The main thing is to carry on with those changes because they do change everything for better!! Here are 30 Super Easy Ways to Improve Your Homeschool Today! 1 – Put the oxygen mask on you first. Self-care is essential, mama! A rested mom, who takes good care of herself, is a much happier mom. Physical and mental exhaustion put me in critical care paralyzed from head to toe 3 years ago. You can read my story here and here. 2 – Find your tribe. Every mom needs 3 things: community, encouragement, and support. I found my best support here. These ladies became my cheerleaders, advisers, and some of them became my best friends! 3 – Keep it simple. What you do is enough! You don’t need to complicate things. Simplicity has become my best friend this year. Keep your homeschool routine simple, keep your meals simple, keep your life simple as much as you can! The simpler, the better. 4 – Stop adding more curriculum. We homeschool moms, are addicted to adding more to our curriculum! We need to get rid of this addiction. The reality is: all these extras are making our homeschool overwhelming and unproductive. If you want to learn once and for all how to choose the right curriculum for your family, so you don’t waste money and time, check out my magic formula here. 5 – Don’t overwork your kids. Charlotte Mason recommended that we keep our lesson shorts, about 20 minutes each for the youngest ones. I am so guilty of overworking myself during the first years of homeschooling and the results were awful, we were all miserable and hating homeschooling. It took me a while to figure out that a few sentences of excellent handwriting were enough for their morning practice instead of pages of it. Same thing with math. If they do well the first 10-20 fractions, why force them to do 50? So, don’t overwork your children. 6 – Don’t overwhelm yourself. You don’t have to do everything on your own. Teach your kids to be independent! This is your goal, mama! Our homeschool is getting done in half of the time than we used to since I created these checklists for them. And you don’t have to do everything every day either. Start using a loop schedule today. Take turn accomplishing things in your home and in your homeschool. 7 – Don’t over schedule. Homeschool already takes a big chunk of our days, plus we have all the housework to do and for some of us, work to do from home as well. So keep your family’s schedule light! This year we cut out on extracurricular lessons for our kids. Yep, we did! No ballet, no swimming, no ice skating, etc… Why? Because we were all running in an exhaustion mode and we having no family time to just chill and talk together. The difference was HUGE!! We were all happier and none of my kids ever complained about not going to extra classes. 8 – Create margins and make room to breathe! My biggest accomplished this past year was to have an empty agenda where I could fit anything I wanted to, anytime! That means having a playdate when my friends called or taking my kids’ swimming just for fun after finishing our homeschool work done. Creating margins also allowed my husband and me to start having date nights again! 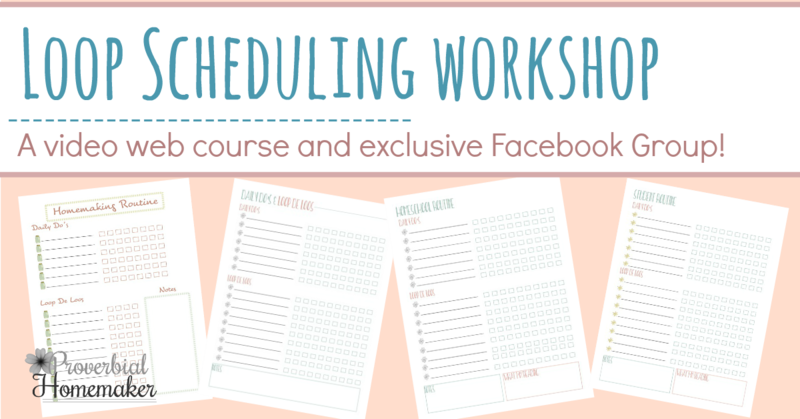 Here is my secret to take control of your busy mom schedule once and for all. 9 – LESS IS BETTER, do less but do it well. Cut the extras! You can’t do 12 subjects in a day. Maybe I’m exaggerating but it sure feels like sometimes. At our home, I keep Language Arts and Math as daily subjects then we alternate between science and History/Geography from Monday to Thursday leaving Fridays for fun extra subjects using a loop schedule like nature studies, picture studies, composers, hymn study, etc. 10 – Focus on the relationships not just on the to-do list! Homeschooling is a great opportunity to develop a strong bond with your children, to get to know them better, to become their best friend, their counselor… I have a frame on my wall with a very simple and powerful prayer that reminds me constantly to pay attention to my kids’ needs. It simply says: “May I be all they need me to be. Amen.” That’s it. So simple, right? Sometimes a long day of stressful homeschool can hurt the relationships. You can lose your patience, yell, be rude because after all you have been teaching them all day long and things are not going as you plan. Well, clearly when things go this direction, is time to close the books and focus on the relationships. 11 – Be a student of your child. 12 – Value what they value so they can value what you value. This is an important principle I just learned and it works in our marriage too. If you pay careful attention to what matters to them (even when you are not really interested), they will also pay careful attention to what you share with them. What is important to them matters! Don’t say: “That’s not important.” or “I don’t care.” Remember you are modeling to your child 24/7. Everything about your child is important to you. 13 – Celebrate all accomplishments big or small. Focus on what they do right much more than what they do wrong and they will keep doing better! No accomplish is too small you should not celebrate. Let your children know what a great job they are doing with the letter p, for example. Or what an awesome story they wrote. Say “Well done!” more frequently. I love receiving compliments, don’t you? So do they. It builds their self-esteem. It feels them with enthusiasm to keep improving. 14 – Write each other notes. I love getting notes from my kids! And I know they love getting little notes from me too. Create a “mailbox” for your special notes to each other. This is a fun way to also help them with their writing skills, spelling, etc. 15 – Have a tea party once a week. Our highlight of the week is often our Poetry Teatime, either we do it on our own or invite some friends to participate, Poetry Teatime brings fun and celebration to our learning time. We bake cookies together, read aloud our favorite poetry books while making big gestures expressions, sometimes we even put an accent to it – just for fun! I can go and on with all the benefits of reading aloud to your children… but here is my favorite one: Cuddling to read stories with them and watching their little eyes sparkle or watching them laughing while I read is precious! The benefits of reading out are endless starting with creating a habit of reading daily in your children’s life. Homeschooling is a great opportunity to connect with your children even physically. This is specifically beneficial if you have a child whose love languages is physical touch like I do. By the way, knowing my kids’ love languages has helped me immensely to engage with them better, even in our homeschool. When we hug our kids we are filling their love tanks up. A warm hug to begin the day will mean “I love you”, “You are important to me”, “You can count on me” to your child. Hugs give us a sense of comfort and security. It reaffirms our sense of belonging. 18 – Praise them often! Kids respond to positive reinforcement! We are so quick to criticize or to point the wrongdoings and slow to appreciate their good efforts. They need to be encouraged by our words. Our words are powerful and can build them up or tear them down. 19 – When everything gets stressful, close the books! An important thing to remember when homeschooling is that we are parents first. During some stressful homeschool moments, we have an opportunity to parent the heart of our children, teach them how to deal with struggles, and connect with them on a special level. Once things calm down, find something fun to do! You can always pick up things where you left. 20 – Allow some fun in your homeschool. Did you know there are tons of games that are extremely educational? Why not add some game time to your homeschool schedule. This is a great way to take a break from books while your kids keep learning. Here is a list of super fun math games I compiled to help kids learn math while playing. My kids love these games! 21 – Your calendar is yours! You don’t need to follow the public school’s calendar or anybody’s else’s calendar. We homeschool year round so we can stretch our curriculum and take our time learning without any pressure. We also prefer using a 4-day schedule instead of 5, so we have time to catch up at the end of the week or simply enjoy our Fun Fridays. I’ve seen families homeschooling from January to December and others stopping for a break after every 6 weeks. Find what works for your family! 22 – You are not behind! Did you hear that? Behind what or who? You have the beautiful freedom to homeschool your children at their own pace, thus, there is no such a thing as falling behind. This revelation has taken a ton off my shoulders and I pray it will take the heavy burden off of yours too! As long as you are moving forward, you are not behind. As we all learned from The Tortoise and The Hare’s fable at some point in life, slow and steady win the race. 23 – Don’t fall into the comparison trap. Never compare your children and never compare yourself with other homeschool moms. You are unique, your kids are unique. Your homeschool journey is completely and uniquely yours. A comparison can either make us proud or bitter. Usually, it makes us more bitter than proud. If so, it robs our joy, discourage us, and make us think less of ourselves and of our children. So, why go there, right? 24 – Take a homeschool break every once in a while just because… you need it!!! You don’t need to wait for Christmas or summer to come around to take a homeschool break. In fact, let’s just face it, our Christmas break feels like no break at all most years, right? Be intentional about taking breaks. Not to plan your homeschool or catch up with a holiday or a project – but to just to rest! I often talk about my 3Rs: Rest, Re-evaluate, and Realign. We all need to add more breaks into our lives to simply rest. 25 – Enjoy every minute. Be fully present! Put the phone away or turn off the notifications. Turn off the TV. Stop spending endless hours on Facebook. Eliminate all distractions and focus on what really matters in your life. You will never regret that. Don’t just snap the shots to share it on Instagram, instead, capture the special moments to your own memory. Write about those special moments in a journal. Add the pictures if you want to. But the point is, start to intentionally make memories with your children as you homeschool them. It is such a blessing to be able to stay home and spend more time with them – take advantage of it! Not every one second of our life will be repeated, so capture those moments in your heart and cherish them! Here is how we are making memories together in our homeschool. 27 – Laugh with your children. A good laugh is a good medicine!! We need to be silly and laugh often together! Why not buy some clean jokes’ books and add it to your morning basket so you can also start your day with a good belly laugh? 28 – Have more fun with your kids! I am so guilty of this one. I am not naturally the fun mom. I need to be intentional about finding ways to have fun with my kids. Did you get that? Fun with my kids. Last week, we crack on the music loud outside and I danced with my kids – they were speechless watching me dancing! Not that I was any good at, but because I did something fun that they were not expecting. And guess what? I had so much fun! We need to play more games together. We need to add more fun to our days. Remember, homeschool moms need to have fun too, not just the kids. 29 – Go for walks. Explore places without a teaching agenda behind, just walk around the block, walk to the park… Awesome conversations can happen when you are outdoors walking with your children. My kids love going for nature walks once a week. We are blessed to live in a gorgeous area with a wildlife sanctuary right by our place here in British Columbia. We almost daily get observe bald eagles flying over our heads – they are so majestic! Last year, we added Exploring Nature With Children to our homeschool. This curriculum is fantastic and it has helped me, the not fun and not really outdoor mom either, to go out for nature walks and explore with my kids. Exploring a salmon spawning area behind our place. 30 – Create a home they will always want to come back to! I have been striving to create a home for our family that is godly, loving, orderly, peaceful, and let me add fun too. Our homeschool journey allows us to invest in creating a home like this. Every day we have an opportunity to make our homes better and to give our children a life-giving home that they will want to model after too. A home that is inviting and comforting. A place they will feel loved, accepted, and that they will always want to come back to – even when they grow old. When you intentionally focus on creating this kind of home for your homeschoolers, everything else starts to improve, not just your homeschool. I pray that these 30 tips will help you to improve your HOMEschool today! YOUR TURN: From the 30 super easy ways to improve your homeschool, which ones do you need to start working on right away? The words are so refreshing! As a homeschool mom for 10 years and a few more to go, I know we get into a rut and feel overwhelmed in our day to day busy, very busy lives. For me, I need to pull off my pride from my heart, and take off the signs that I hang around my neck “I can do this on my own” and “I don’t need any help”. We all need to stop and rest. Sit down and give ALL ourselves to God. These 30 points that Ana shares are morsels of sweetness for us moms to devour and enjoy. Then use the energy of the words to push all of us forward to better moms for our children. Oh, Amy, that is so true!! We need to push pride aside and not be ashamed of asking for help when we need, even in our homeschool. I love your comment so much!! It brought tears to my eyes. The struggle is real and these 30 dos and don’ts make everything so much easier! !